A Facebook Fan Page have become a standard in Social Media lately. But forget about learning how to set up a page, learning and scripting the specifics of Facebook FBML . With the following Facebook Fan Page Template and themes and some XML customization work you can create your own unique and stylish Facebook fanpage. Use your own Facebook content or all kinds of external sources like your Blog, your Twitter account, some Flickr pics for example to bring together all your WWW activities. 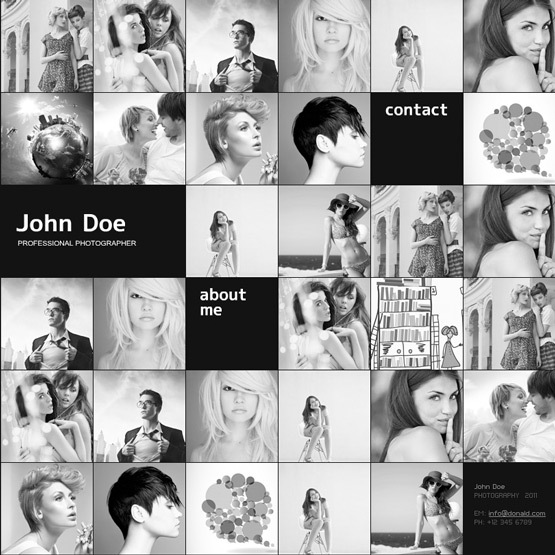 Facebook Timeline Creative XML Portfolio. 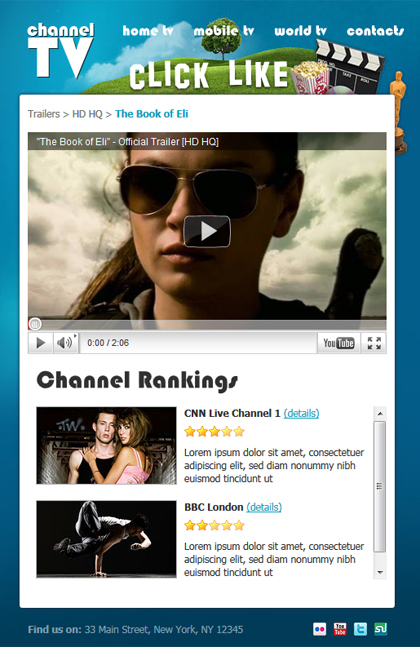 Very simple structure of XML and PHP allows you to change all content texts, logo and images fast. This stylish timeline template (810px) is excellent choice for every painter, photographer, musician and anyone who needs portfolio! If you are searching something different and out of the line, please check out the Supreme Facebook Timeline Template. 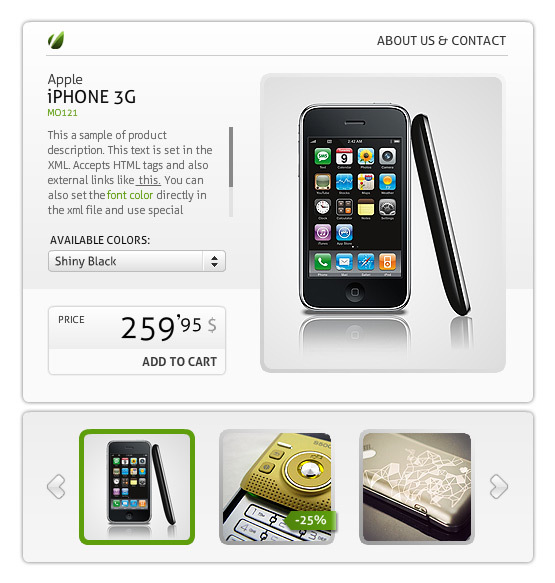 Supreme is a fully configurable and easy to use website template with a lot of great features. It has been specifically designed to be easily customized and it’s created for creatives who want to make portfolio in few minutes. Clean and useful flash Facebook fan page with image slider, youtube and image gallery, mp3 audio controller map and contact form. Timeline cover, profile picture and tab image are included. 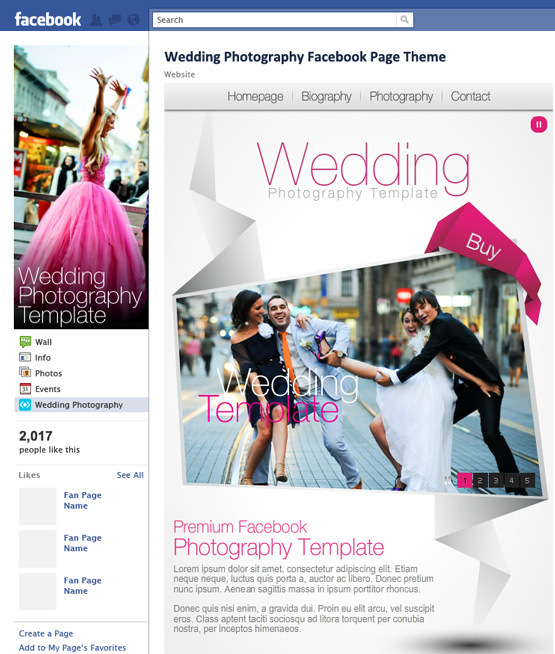 Wedding Photography Facebook Page Template is a XML Flash Template build for Facebook Fan Pages. It is fully XML driven and it presents you with the ideal solutions, containing modules such as: – homepage slideshow module – biography text module with or without images – gallery module – contact module – support for background music. 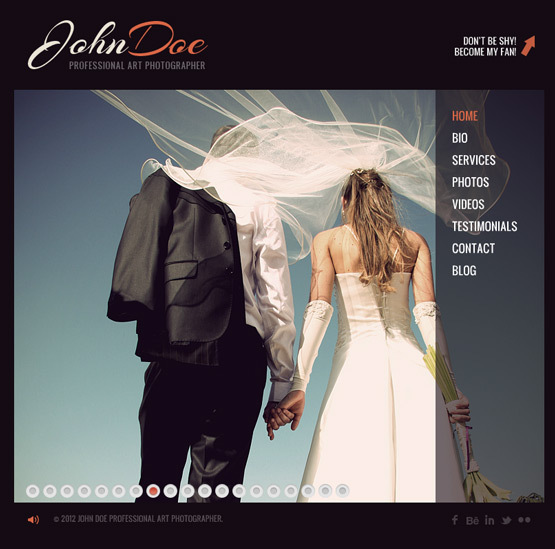 This is an excellent template for wedding, engagement, event and boudoir photographers. Photo & Video Facebook Page Template is a fully configurable and easy to use Facebook page template with a lot of great features. It has been specifically designed to be easily customized with all pages driven by XML and it’s created for photographers and videographers who want to make a Facebook portfolio in few minutes. Photography Facebook Page Template is a fully configurable and easy to use Facebook page template with a lot of great features. It has been specifically designed to be easily customized with all pages driven by XML and it’s created for photographers who want to make a Facebook portfolio in few minutes. Premium Photo & Video Facebook Timeline Template is a fully configurable and easy to use Facebook TIMELINE template with a lot of great features. It has been specifically designed to be easily customized with all pages driven by XML and it’s created for photographers and videographers who want to make a Facebook portfolio in few minutes. Timeline is the new Facebook profile. 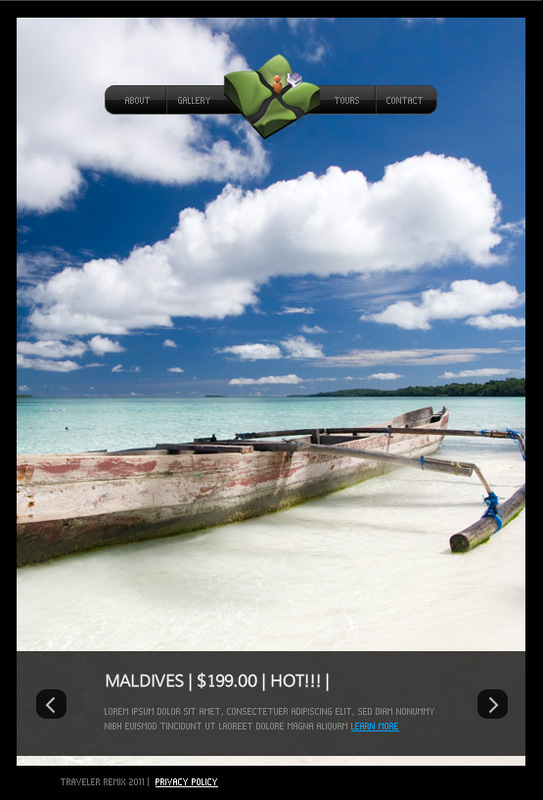 Tell your life story through photos, friendships and personal milestones like graduating or travelling to new places. 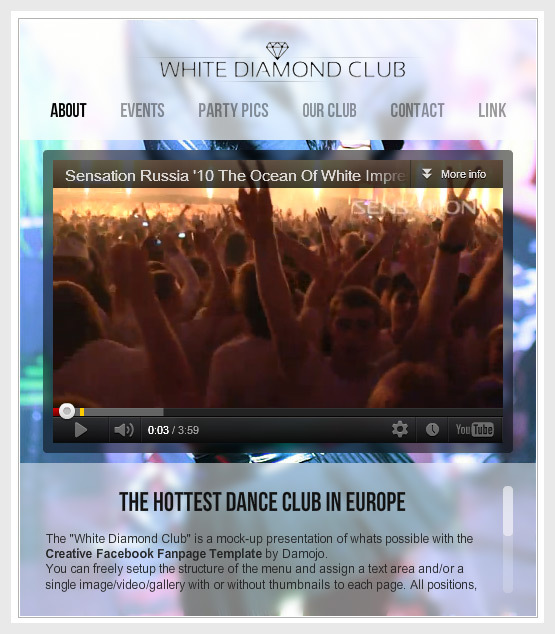 This is a Flash AS 3.0 XML driven Template for Facebook Fan Page. Have support for fullscreen background(jpg, png, gif, swf, video). This SHOP template is mainly focused for Facebook fan pages, though it can be easily used as a useful module inside any flash template, using external SWF loading. 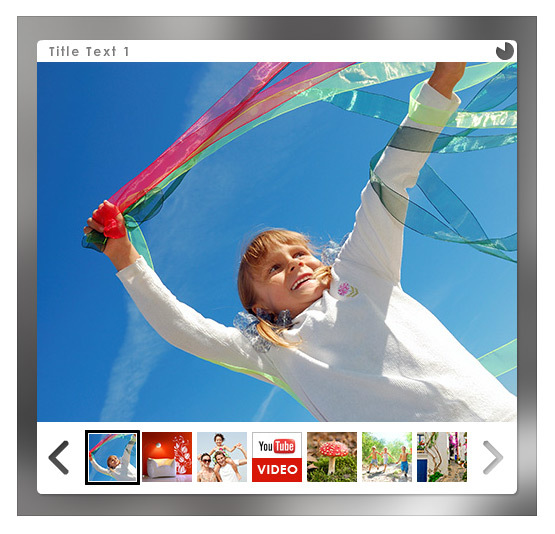 It has a powerful catalog to display any kind of media content, images, swf’s and videos. It has a clean and minimal style, which can be easily customized (almost 40 configuration parameters), from the xml file. Also several layered Photoshop files with the preview designs are included in the pack. This is a Flash Template prepared for Facebook’s Fan Page Tab. Editable through single XML file and no Flash authoring skills needed to customize / update data. 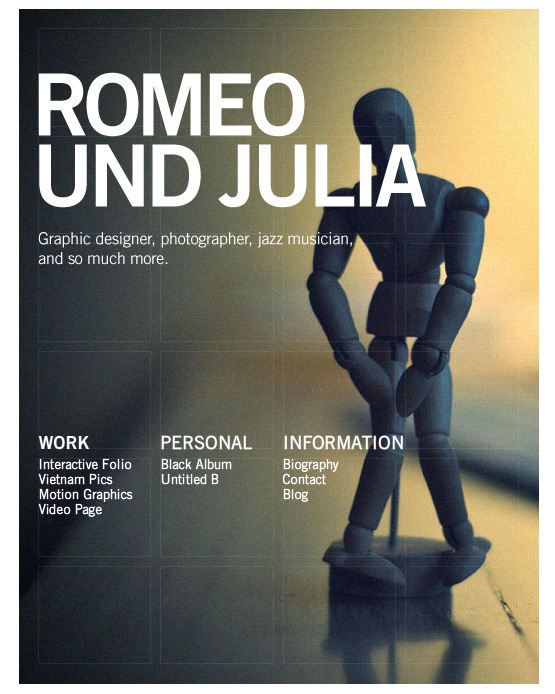 Just inserting your image for background and choosing right Text Color can bring expected feel and uniqueness to the page. Supports dimensions up to 520px wide and unlimited height. The template is build in a modular way which allows you to design completely different looking pages and reuse those several times if needed. 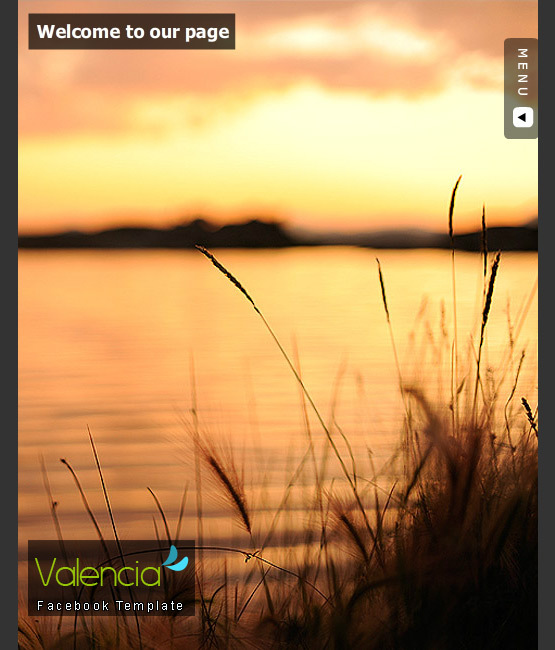 The amount of pages is limited only by the templates width (Menu font size and spacings are adjustable). This is a template with fully XML driven template specifically designed to be used on a Facebook Page. Everything from the menu structure, to colors and images is controlled via a XML file so there is no need for you to ever open the source files in Flash (Only needed if you want to modify the used font type). With this file I am giving you a powerful creative tool with an enormous amount of options and design possibilities. 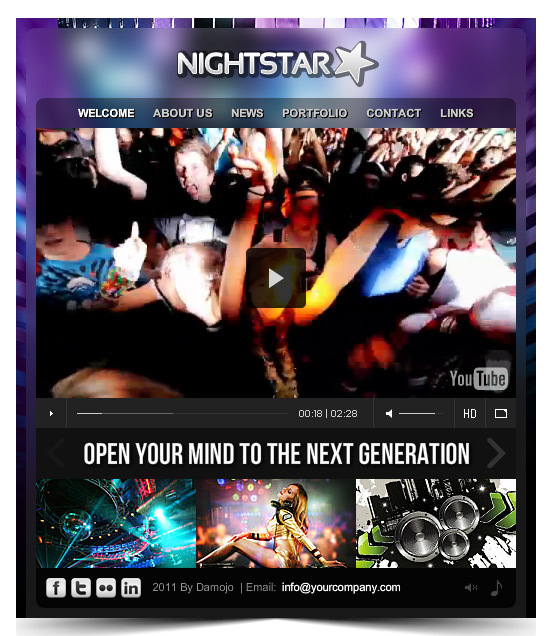 “Nightstar” is a next generation Facebook Template, putting all the features of a full-blown Website Template into a Facebook Fanpage Application! No Flash or Flash knowledge is necessary. Its possible to easily adjust all visible colors, images and texts by editing XML configuration files in an ordinary editor like notepad. Creative template mainly focused for Restaurants and Hotels that want to have a stylish presence in Facebook, the world’s favorite social network. 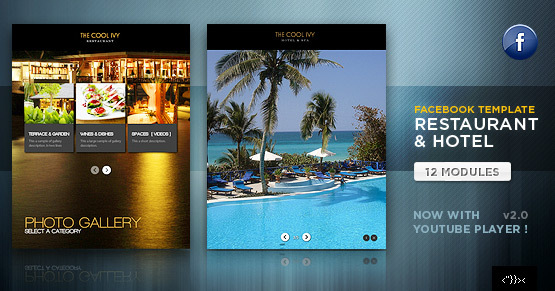 Really flexible design and structure that can be used in many ways, even for other corporate sites. It has a clean and minimal style, which can be easily customized (menu structure, all elements position, global size, color scheme, etc. ), from the xml file. Also a full layered photoshop file with the design elements is included in the pack. This Facebook page template is build with a fixed dimensions of 810×800. You do not have to have Flash installed or open a fla to edit this template. Unlimited modules can be added to the menu. Facebook flash template with 7 modules, unique transitions and built to be easy integrated in your page. 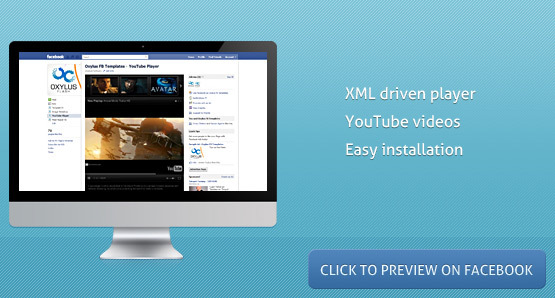 AS3 XML driven Facebook fan / web page template. Whether you’re an aspiring young creative professional or seasoned photographer this template was designed to give you a quick and easy way to showcase your work on the world’s largest social network website. Don’t just collect friends. Give them something to look at—something that says you’re a professional. 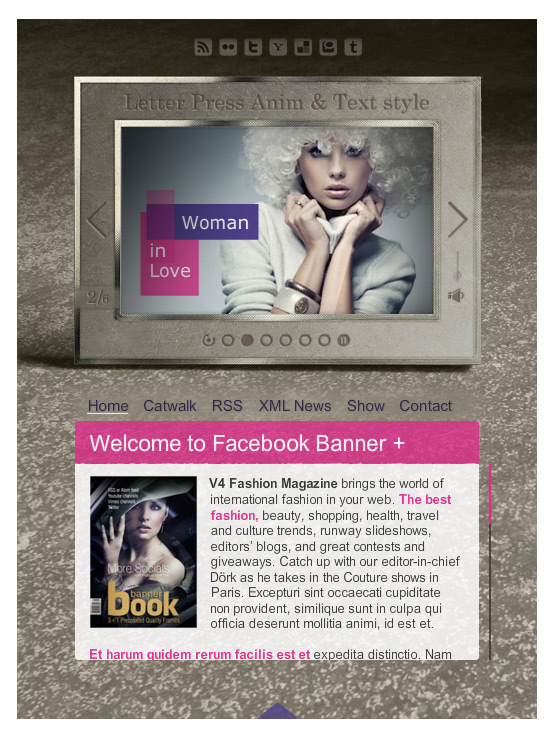 Showcase your work with “Flipbook The XML Facebook Fan Page”. A fantastic Facebook application with all the features to introduce your Portfolio or Company to the facebook users. You have RSS FEEDS reader to update the news from your website (blog), dinamic image gallery and contents change by XML . All maintenance is simple and fast so You can change all the contents quickly and efficiently! Need an eyecatcher as Facebook Fan Page to gain more from your Social Network activity? Works with the old and the new Facebook pages design! This template is build to fit in perfectly in your Facebook’s Fan Page Tab and uses Flash technology to do things FBML and HTML is not able to. 500 million Facebook users are waiting to get impressed by your page. 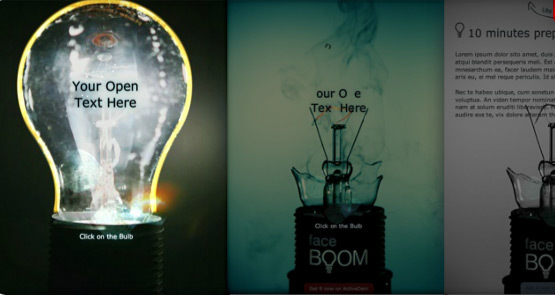 This explosive Bulb Splash could be the eyecatcher on your Facebook Fan Page to gain more from your Social Network activity. It is build to fit in perfectly in your Facebook’s Fan Page Tab and uses Flash technology to do things HTML is not able to. You do not need to open any FLA to edit this Facebook Splash Site. The preparation time is less then 10 minutes. A few minutes to change your texts and to add your logo. All via XML and off you GO! 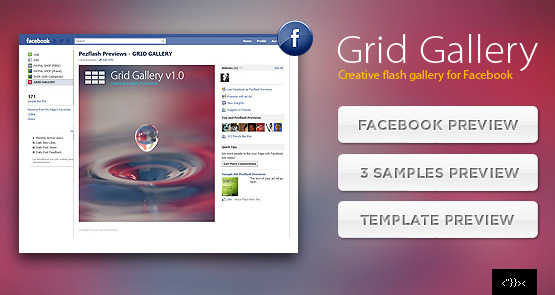 Enhance your Facebook Pages (or any other flash & non-flash site) with this powerful and flexible grid gallery. XML Driven flash template with more than 15 configuration parameters. This is a Facebook Fan Page with XML Driven,Black/White style and More Layouts. You also can set logo/menu layout and site information/social layout.You can add any module into the template just through the xml file. It can also be used alone with the Facebook fanpage site’s framework. Facebook Fan Page with XML settings what can be set using even a text editor. AS3 Flash Facebook Shop is a powerful dynamic shop, you can easily change all shop contents, Highlight Colours, Shop Labels and Texts via XML file. This is a Flash XML Shop with PayPal & PHP Mail Order. 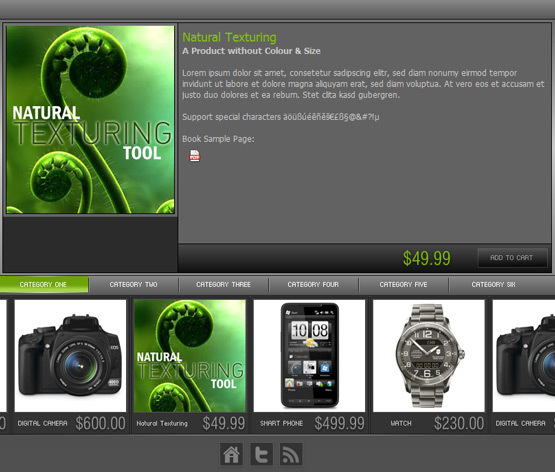 This shop includes four different modules on XML product settings that let you sell almost every type of products. You can embed this Flash Facebook template in your Facebook’s fan page. 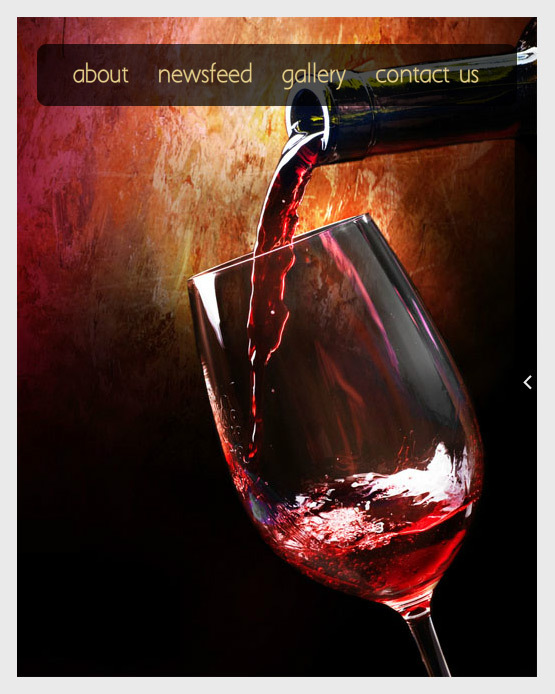 It is meant to be a simple template with about page, news feed, a simple gallery with description and a contact page. 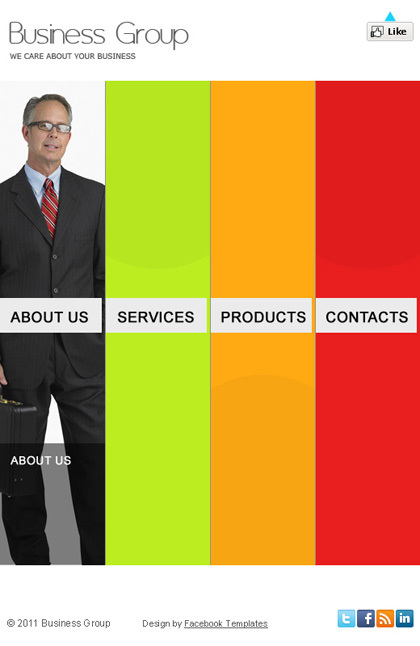 It’s a simple Flash Template built with Tweenlite engine. The advanced tweening is made possible by the amazing Tweenlite. There is a presentation page, a simple news page and a gallery page. 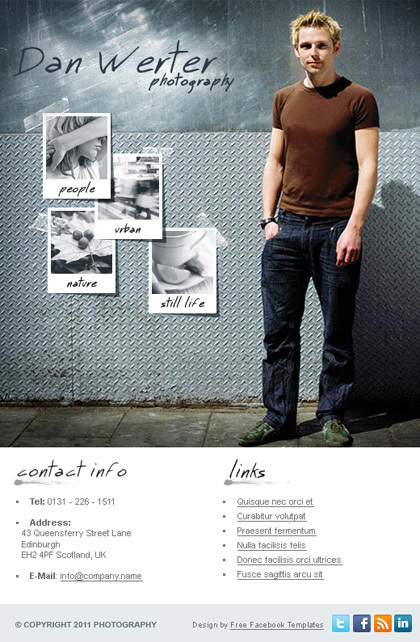 You can also add a contact in a creative way. With a very simple structure of XML and PHP, this Facebook template allow you to change all content texts, logo and images fast. This stylish template is excellent choice for any kind of business (travel agency, photographer, musician, anyone who needs portfolio, etc.). Video Fan page for Facebook. Loaded dynamically, you can ease change settings from xml files.Included video banner flv, youtube, as3. 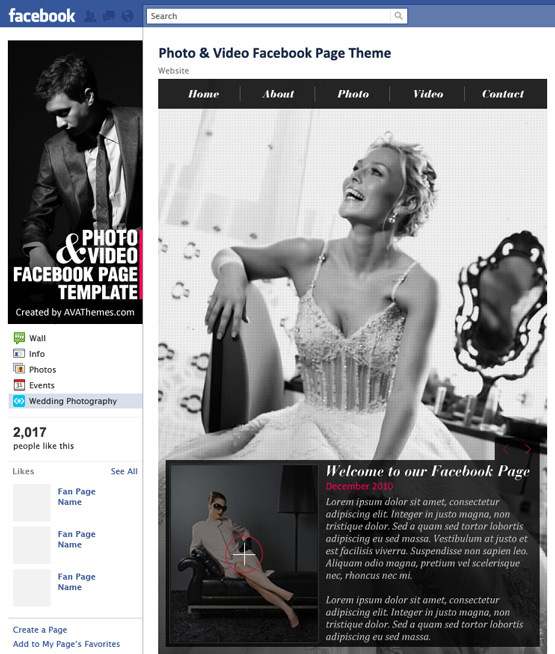 Glamour is a XML Flash Template build for Facebook Fan Pages. It is fully XML driven and it presents you with the ideal solutions, containing modules such as: – presentation module that is a full template slideshow with caption text. 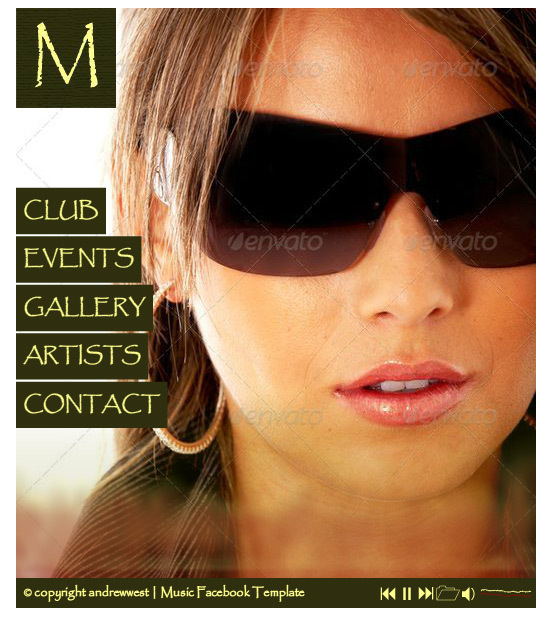 Glamour is an excellent template for artists, photographers and media agencies. This Facebook template come with a MP3 player, playlist and a spectrum display. Very simple structure of XML and PHP allows you to change all content texts, logo and images fast. This stylish template is excellent choice for any kind of business! Can be used for personal Fan page. The logo can be as text or a picture! All configurable via xml files. 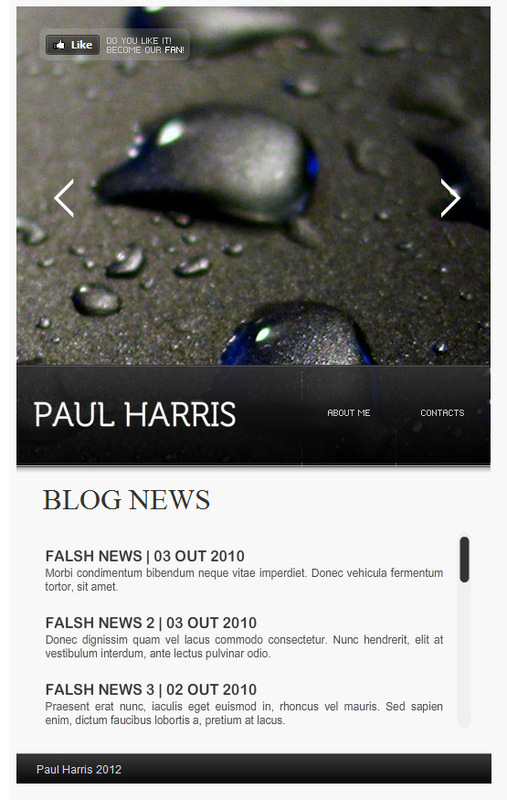 Fully XML Driven AS3 Flash Facebook Template. All loaded pages can be transtromed to position by the master xml file. 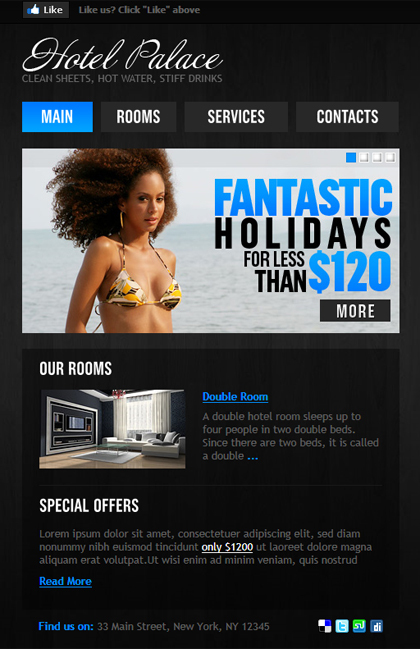 The elegance and subtlety make up the vivid and attractive style of Free Hotel Palace Facebook Template. If you want everyone to wonder at your Facebook Page, then this professional Facebook template is just what you’ve been looking for. You can drastically increase the popularity of your hotel business and point out most essential achievements of yours with Hotel Palace Facebook Template. Free TV channel Video Facebook Template gives you nice opportunities to introduce new film releases and movie news to all Facebook users. 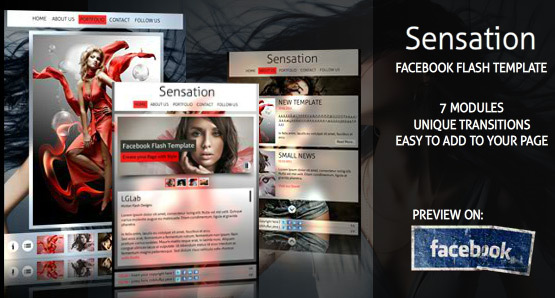 This distinctive design and the original approach of Facebook templates developers make this theme fit all your needs. Night Club Free Facebook Template is devoted to turn any your event or night club show into a marvellous fireworks party. Stylish and calling-to-action design will provoke your friends and fans to attend your evening-party so they will be happy to come next time and bring their friends. Using Facebook social network for your business promotion will be great and wise decision of yours. With Business Group FaceBook template you will be able to draw people’s attention to your business strategies and approaches and present your services in most favorable light to the vast majority of people. The Facebook template we offer for your consideration is worthy and really helpful. It looks stylish and has unmatched visual design, it is very easy to customize and work with. 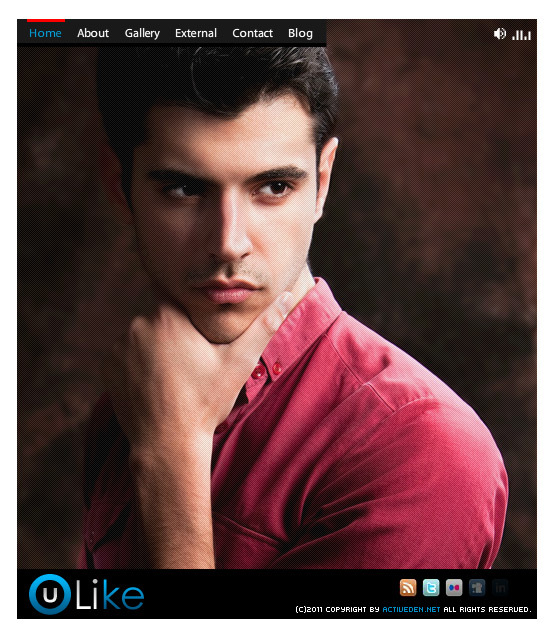 If you are a photographer and looking for the most enjoyable way of sharing your talent through the world using the most user-friendly Facebook social network is a perfect choice. In this case we are happy to give you a helping hand and offer a fascinating free Facebook template developed specially for photography fan page construction.